Recently Android Oreo was released and here is the Lineage OS 15 for OnePlus One (OPO, bacon). 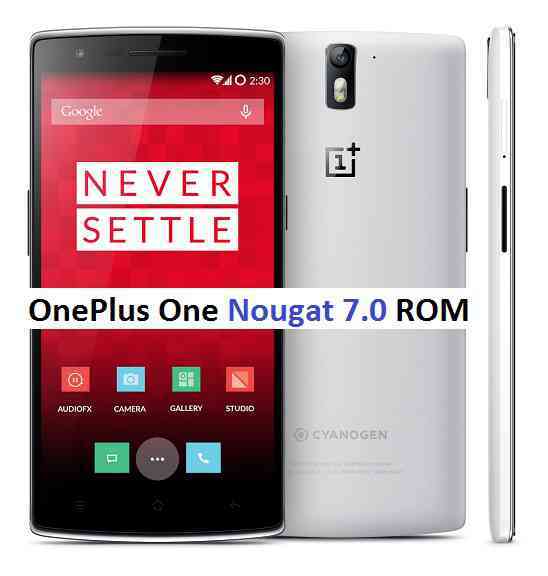 If you are looking to update the OnePlus ONE to Android Nougat 7 version then have a look here on the: Lineage OS 14.1 for OnePlus One which has recently got OFFICIAL LINEAGE update, OnePlus One OFFICIAL CM14.1 (CyanogenMod 14.1) ROM, UNOFFICIAL OnePlus One CM14 (CyanogenMod 14) Nougat 7.0 ROM and OnePlus One AOSP Nougat ROM update which are available for the device. With the recently released Android Nougat for the recent Nexus devices: Nexus 6p and Nexus 5x, and after that the Android Nougat Source code release has accelerated the excitement and also within a week we have seen many Android Nougat AOSP ROMs and many CyanogenMod 14 ROMs already available via unofficial builds with the help of developer community, thanks to the Android Open Source codebase. The Lineage OS 14.1 for OnePlus One is the most downloaded Lineage OS ROM among all Android devices, which clearly show the popularity of Lineage OS ROM among OPO users. Now it has got the OFFICIAL Lineage OS 14.1 update while it is still a NIGHTLY where you can expect minor BUGs but the ROM can be used as a daily driver without any issues at all. That’s the beauty of an OFFICIAL Lineage OS ROM. Earlier developer updateing over xda had brought this Android Nougat Update for OnePlus One (OPO) for the first where most of the features and hardware of this device are functional with this Nougat ROM. This is just an vanilla AOSP Nougat ROM without any crazy hacks or mods. Along with the AOSP ROM, we also have the OnePlus One CyanogenMod 14 ROM for which we don’t have the working and non-working status. As these are initial builds which means there will be many BUGS known and unknown and of course there are work arounds also available to FIX many of those issues (for the AOSP ROM). If you are interested to try the Android Nougat 7.0 for OnePlus One then try following any of the ROM update link which has complete step-by-step guide. If you are looking to update the OnePlus One to Nougat 7.0 then here we have the Lineage OS 14.1 for OnePlus One, One Plus One Nougat 7.0 AOSP ROM installation guide and we also have the CM14 for OnePlus One. The guide has basic requirements listed with the ROM download link, link to the development thread in case you want to file bugs for this ROM and a detailed step-by-step ROM update guide. You just select the ROM you want to flash on OnePlus One and follow the corresponding ROM flashing guide, that’s all! The AOSP ROM update guide also has a Working and Non-working list which one must not ignore as the Nougat ROM build for OnePlus One is an initial experimental build. But the OnePlus One CM14 ROM does not have a working and non-working status details and hence take backup and be cautious before updating the CM14 update. Also it is always recommended to have a complete backup of all the data on your Android phone or if the phone installed with a TWRP/CWM or any other custom recovery then we recommend to take a NANDROID backup regardless of the ROM build status. If you are interested then you can head over to the OnePlus One Android Nougat ROM and/or the OnePlus One CyanogenMod 14 ROM link to have an early taste of Nougat.